This tutorial shows you how to hook into WordPress’ authentication system. You can now use more than a simple username/password combination! While working on an update for the Absolute Privacy WordPress plugin, I decided to revamp how the plugin handles authentication. The current version of the plugin (1.3), uses a custom wp_authenticate function which bypasses the standard authentication found in pluggable.php. This has essentially been the standard method of using the functions contained in the pluggable file. Beginning with WordPress 2.8, an ‘authenticate’ filter was added which allowed for some flexibility when authenticating a user without having to completely overwrite the wp_authenticate function. Unfortunately, using this filter wasn’t well documented. The authenticate filter is found on line 6. It passes both the username and the password and assigns the result to the $user. This is where we will add our custom authentication criteria. In our case, let’s do something simple. Let’s deny access if the $username is ‘bob’. Of course, you could be more functional and deny access by user role (like Absolute Privacy does), or what have you. In addition, let’s give a meaningful error message so Bob knows what’s going on. This is adding the ‘my_custom_function’ to the ‘authenticate’ filter, with a priority of 10, and passing 3 arguments (null, $username, and $password). This function simply checks if the username is Bob. 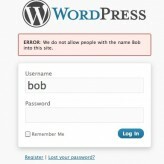 If it is, it assigns the $user to be a new WP_Error with the name of “denied”. If you were to try this function out now, you’ll notice that someone with the username “Bob” is still allowed to log in. Why? Because unfortunately the authentication sequence isn’t aborted if $user is assigned as a WP_Error.